There’s been a lot of complaints about Hollywood’s obsession with rebooting, remaking, and revisiting popular films from the past few decades. 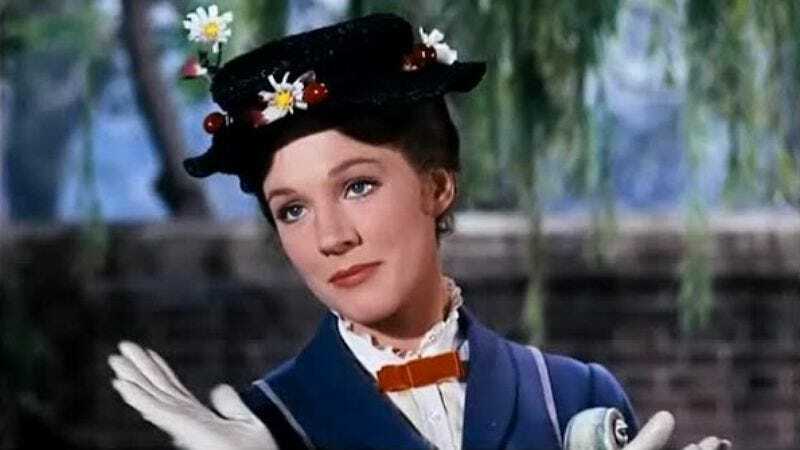 But while the world has stood by as everything from Terminator to Jurassic Park to Cinderella gets a reboot, it’s possible we’ve finally reached peak reboot: According to Variety, Disney has plans to revitalize Mary Poppins with a brand-new musical movie set 20 years after the original. Because as they say: A spoonful of nostalgia helps the corporate profits go up. Go-to musical movie director Rob Marshall is set to helm the project, which will be produced by his Into The Woods collaborators John DeLuca and Marc Platt. Fans will likely have a lot of questions about how the trio will revisit a property that has served as such an iconic part of so many childhoods. But given that Disney is currently working on an Aladdin prequel, a Prince Charming spinoff, and remakes of The Jungle Book, Beauty And The Beast, The Sword And The Stone, Dumbo, Pinocchio, Winnie The Pooh, and Mulan, the company is probably used to those questions by now. There’s no word on whether this sequel/reboot will be “dark and gritty,” although that would actually be more in keeping with the harsher Mary Poppins from the novels. And since it’s still very early days, it’s anyone’s guess as to who will step into the iconic role that earned Julie Andrews a Best Actress Oscar. Perhaps Lady Gaga is free.